TIP: Serve with braised red cabbage, cucumber salad and assorted pickles for a special Hungarian-inspired feast. Heat oil in large skillet set over medium heat; cook onion and celery for about 5 minutes or until softened but not browned. Stir in garlic. Add potatoes; sprinkle with salt, pepper, caraway and coriander. Stir to combine. Pour in broth; simmer for about 10 minutes or until potatoes are tender and liquid has evaporated. Let cool completely. Stir in dill and parsley. Meanwhile, preheat oven to 350°F. Remove neck and giblets from turkey. Using paper towel, pat inside and outside of turkey dry. Stir together salt, paprika, thyme, oregano, pepper, coriander, mustard powder and cayenne. Rub oil all over turkey; sprinkle paprika mixture all over turkey and rub until evenly coated. Fill cavity with stuffing, allowing it to mound slightly. Carefully transfer turkey to roasting pan fitted with metal rack. Pour in white wine and 1 cup broth. Roast for 3 1/2 to 4 hours or until instant-read thermometer registers 170°F when inserted into thickest part of the thigh (if turkey starts to darken too quickly, cover with foil). Tent with foil and let stand for 20 minutes. Spoon stuffing into bowl; keep warm in oven. Carve turkey and arrange on serving platter. Transfer to warm oven. Set roasting pan over two burners on medium-high heat until drippings are sizzling; sprinkle with flour. Cook, stirring and scraping up browned bits, for 2 minutes. Stir in remaining broth, a splash a time, until well combined. Simmer, stirring constantly, for 5 to 7 minutes or until gravy is thickened. Strain and discard solids. 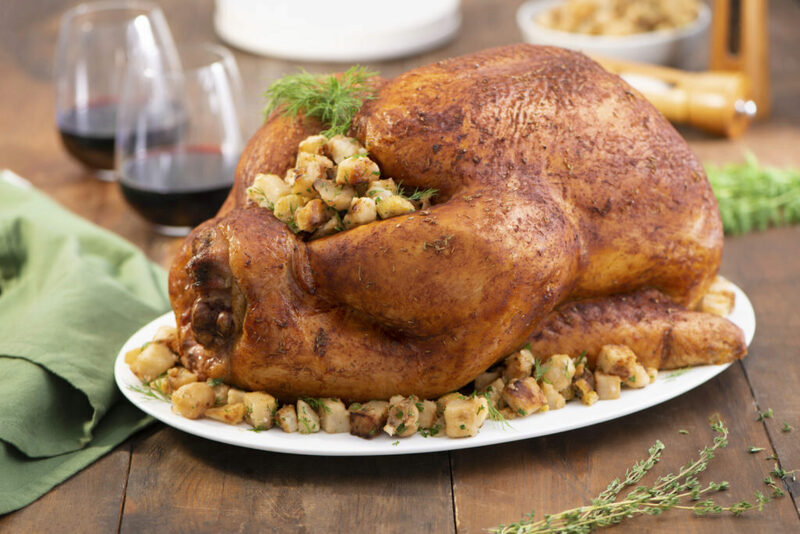 Serve turkey and potato stuffing with gravy.